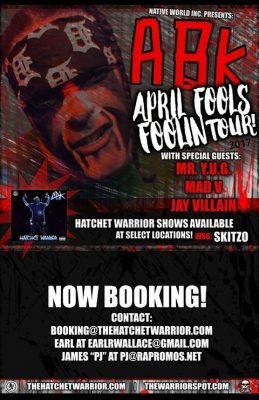 The booking team behind Anybody Killa are currently working on booking dates for the 2017 edition of the “April Fools Foolin” tour. On this tour Anybody Killa will be joined by Mr. Y.U.G., Mad V and Jay Villain. 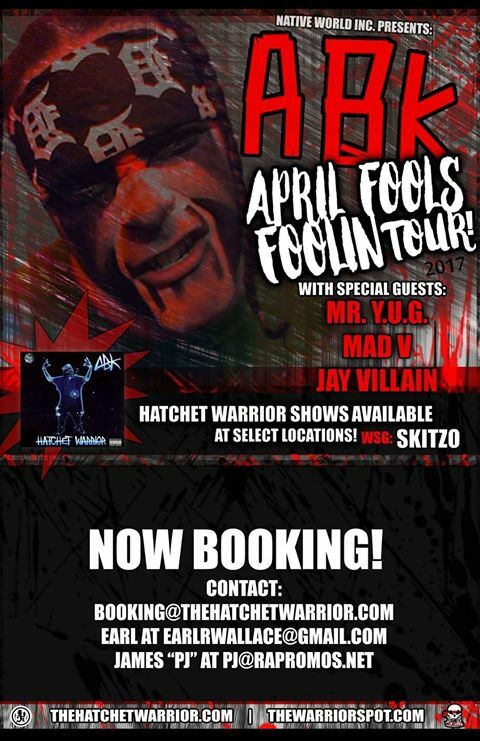 They are also booking “Hatchet Warrior” shows at select locations. During these shows ABK will be joined by Skitzo. Yeah I saw Earl post something about this a week ago I think. Hopefully they come back to the 785 this year. Wish Freddy Grimes was on there to promote Flesh a little more. Can’t wait for that debut on NWI to drop. Hope we get a Hatchet Warrior Show, probably my #1 ABK album, next to Medicine Bag.